Determining observer points is a computer-intensive process. The processing time is dependent on the resolution. For preliminary studies, you may want to use a coarser cell size to reduce the number of cells in the input. Use the full-resolution raster when the final results are ready to be generated. 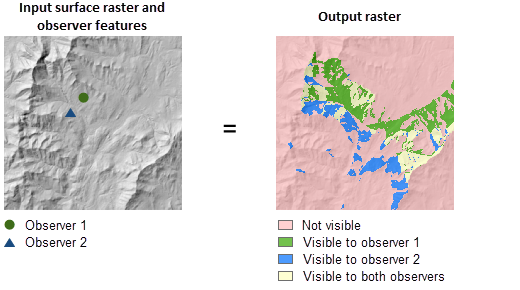 If the input raster contains undesirable noise caused by sampling errors, and you have the ArcGIS Spatial Analyst extension available, you can smooth the raster with a low-pass filter, such as the Mean option of Focal Statistics, before running this tool. The visibility of each cell center is determined by comparing the altitude angle to the cell center with the altitude angle to the local horizon. The local horizon is computed by considering the intervening terrain between the point of observation and the current cell center. If the point lies above the local horizon, it is considered visible. An optional above ground level (AGL) output raster is provided by the tool. Each cell on the AGL output raster records the minimum height that needs to be added to that cell to make it visible by at least one observer. When the input observer features contain multiple observers, the output value is the minimum of the AGL values from all of the individual observers. The point feature class that identifies the observer locations. The maximum number of points allowed is 16. The output identifies exactly which observer points are visible from each raster surface location. Allows correction for the earth's curvature. FLAT_EARTH —No curvature correction will be applied. This is the default. CURVED_EARTH —Curvature correction will be applied. The AGL result is a raster where each cell value is the minimum height that must be added to an otherwise nonvisible cell to make it visible by at least one observer. Cells that were already visible will have a value of 0 in this output raster. This example identifies exactly which observer points are visible from each raster surface location. #              from each raster surface location.